Hanukkah is important to the Jewish Faith because it celebrates freedom from oppression, reminding Jewish people, as well as people of other creeds and cultures, that fighting for human rights is never a waste of our efforts. 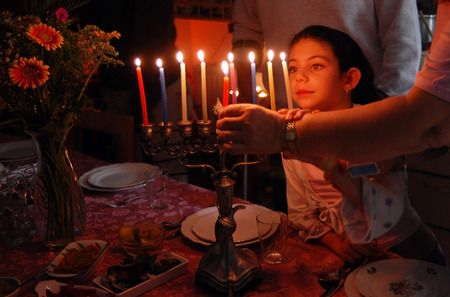 The story of Hanukkah is rooted in a 2,000 year-old history and begins in Israel. At the opposition of a man named Judah Maccabee, a war was waged with a Syrian king, Antiochus IV, who at the time ruled over Israel. The Jewish people, led by Judah, rejected the Greek Gods of the Syrians as they revolted for the next three years. The Jews reigned triumphant as they re-seized control of the temple of Jerusalem and forced the Syrian people to leave Israel. Hanukkah is the celebration of that against-all-odds battle, with a focus on the small amount of oil that miraculously burned for eight straight days in the temple after the war. Jewish people celebrate the revival of the temple of Jerusalem by placing nine candles in a menorah, called a Hanukkiah. Each night of the eight-day celebration starting on December 12 and ending on December 20, another candle is lit. The candle that is lit on the first night is the middle candle called the Shamash. This candle is used to light all the other candles on the menorah. Many families like to hand craft their own menorahs for this important holiday. Many families exchange gifts on each night of the celebration, with both their own family members and sometimes other families. The holiday staple food enjoyed by all is the latke, which is a potato pancake popularly served with sour cream and applesauce. In addition to family dinners, people also honor the traditions of Hanukkah by decorating their homes in blue, white, and silver, and playing dreidel games with chocolate coins. Rabbi Richard Polirer specializes in Jewish education and can help you on your path to conversion. Find out what he can do for you here.